I was at a party in Los Alamos (where one person out of every four has a PhD) last night, and several people started conversations about climate with me. None of them knew that I was interested in climate, and I just listened and didn’t argue with them. One popular theory was that Los Alamos had a very dry summer and it was due to climate change. 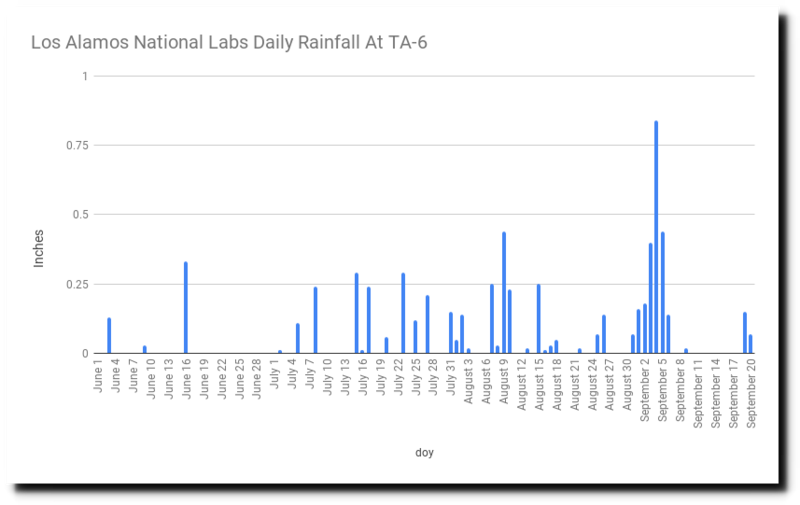 So I checked the official Los Alamos National Labs records and found that they had 39 rainy days this summer and received 6.44 inches of rain. Another old friend who now lives in Massachusetts and is married to a nuclear physicist, was discussing the record cold New Years they had in the East. She saw that as proof of climate change. Climate superstition is strong among the most educated people in the world. Because they tend to rely heavily on propaganda sources like the New York Times and NPR for their misinformation. 20 Responses to Climate Superstition Works! Does Greenland having a cold Feb prove the broken jet stream coming from Greenland is a farce? In 20145 scientists attributed a correlation between Greenland being warm and the USA being cold. Tony, you should post the rainfall records over the years to show there is no trend of bipolar weather in Los Alamos. Once again proving that advanced degrees really are no indication of advanced intelligence. All they prove is that you paid a lot of money and spent a lot of time impressing another miseducated idiot. Gator, there’s another aspect to such naivety by these scientists. What is called “professional courtesy.” Fields have become so specialized that someone expert in one area is reluctant to challenge ridiculous by people in another area. So they defer, lest they get challenged in their domain. Climate is a generalist field where no one is expert in all the disciplines that are involved. So it becomes a power game where those most aggressive and self-confident (think Michael Mann) rule the roost. It’s called a club. And many of those in it have a severely false sense of superiority, which allows them to pass judgement without investigating the facts, AKA the Know-it-all syndrome. Hubris. Part of one of my old jobs was reviewing theses, and you would not believe how stupid most of those people are. They usually started with basic spelling and grammar errors, and then it only got worse from there. Long time ago, as one of the judges in a scientific competition at an elite middle school near a major university I witnessed how the parent members of the “academia club” prepare and groom their children. It was obvious which students did the work on their own, using age-appropriate materials, methods and vocabulary when talking about it. Some of them were very bright and had interesting ideas but you could tell they were still children. I felt good about them and their prospects in life but I knew their work will not come on top at the school. It was very clear which students were “assisted” by their PhD parents—or the parents’ faculty colleagues—as advisors in their presentations. These kids’ work was often very trivial but wrapped in elaborate presentations, using “academic” and “progressive” lingo, presentation boards, charts and such. They were not all necessarily dumb but their work was mostly dull. They went through the paces as they were drilled to do. They practiced to act like self-confident little lecturers and to impress the judges. I could see how their parents prepare them early for an admission into the “club” and functioning in the academic machinery and “elite society”. The worst part was knowing that many of these children will succeed in that and I was facing future members of the academia and progressive elites sitting across me at the table. I felt embarrassed that I participated in the farce and I refused to do it again. Gator and Colorado, you both seem knowledgeable of the educational institutions. I was amazed to see this claim and wonder what they are talking about. Pressured for years to “teach the controversy,” educators have banded together to expel anti-science forces from their classrooms. The only bullying I know of is reputations and careers destroyed by climatists. Sorry Ron, but I cannot take anything from the NRDC any more seriously than I would a column from The Onion. And on second thought, The Onion is a peer reviewed journal compared to arse paper that the NRDC produces. Right, I missed seeing their logo in the webpage corner. They should call themselves NPRDC (National Progressive Resources Defense Council). They defend their “progressive” governmental positions and resources against the citizenry. Two basic psychological principles explain the behavior of the people at your party: Asch conformity and confirmation bias. In the 50’s, Solomon Asch found that people will try to believe what a group holds, even when the people in the group are strangers. If unable to believe, a subject might lie to conform, and when they don’t, they experience mental anguish at being disagreeable. So if ten of your friends are getting grant money based on alarmist climate programs, you’ll find it difficult to piss on their parade by expressing scepticism, especially when you haven’t looked into it in great detail yourself, and when there’s so much propaganda in “reputable” news channels supporting it. Many skeptic scientists have explained how they were awakened when they examined the evidence for themselves, and how difficult a time they had with their peers afterward. Confirmation bias, the tendency to interpret data to support one’s beliefs, explains why every weather fluctuation can be accepted so easily as evidence of climate change. Tony’s reports on NYT stories shows how this tendency can be used for propagandistic purposes. Academic parties can be an especially toxic mix, not only because participants may think they’re at the top of the intellectual food chain, so they can bathe in the approval of their so-esteemed peers, but they can also congratulate themselves on how perceptive they are to notice all the signs that can be taken as confirmation. Tony wisely kept his head down in this environment, where it was probably clear that any expression of contrary ideas would be met with a decade’s worth of Thanksgiving-dinner level irrational argumentation. Anxieties provoked by threats posed to mental constructs can be painful. But from what I’ve read, these tendencies have nothing to do directly with IQ, although I suspect it may be easier for an imaginative person to come up with reasons to legitimize BS beliefs than a dullard. What happens outside academia where there’s more general scepticism? That segment of the population probably isn’t exposed to the same level of alarmist propaganda, and their scepticism doesn’t meet with the same level of disapproval. It’s always a good idea to look into a mirror occasionally to make sure that this pair of tendencies or some others are leading to self-deception, and to understand the exact basis for why you do or don’t think something is true. Our minds are wired so we really are trying to fool ourselves all the time. Eternal vigilance and some humility can help. I had a similar experience lately . A friend who teaches marine biology in Santa Barbara for the summer came back to Hawaii and told of the horrific hot summer there . ” Most the summer was 104 degrees ” . I checked Accuweather and one day there was over 100 . A few barely over 90 and most in the 70’s and low 80’s . Sounds like a pretty awesome summer to me ! With the coastal areas often having a sea breeze. That’s what makes San Diego so nice. Drive less than 30 miles east your in true desert. Imperial dunes. Never realized we had a piece of the Sahara here in the US until one day I took I-8 out of San Diego headed east with a load. What an interesting drive that relatively short interstate is. But I suppose you gave them your web page address . Michael Rectenwald, a lifelong leftist, has found himself shunned by former friends and colleagues — even people whose careers he helped advance — because he criticized and satirized some of the more outlandish SJW behavior on his Twitter feed. Did you see that Anthony Watts used a couple of your graphs?